Universal PVC Post Cover Trim 1/2" x 1 5/8" used to finish any of our 4 or 6 inch Post Cover, for both top and bottom. Being ½" thick, this adds a total of 1" to the footprint of the column shaft. Universal PVC Post Cover Trim 1/2" x 1 5/8" used to finish any of our 4 or 6 inch Post Cover, for both top and bottom. Being ½" thick, this adds a total of 1" to the footprint of the column shaft. Shipped in 2 -- 3ft pieces for both top and bottom, they can easily be cut on site to fit any of post covers up to 7" square. Note: Before cutting trim, first compress (by hand) all four sides around the column shaft. 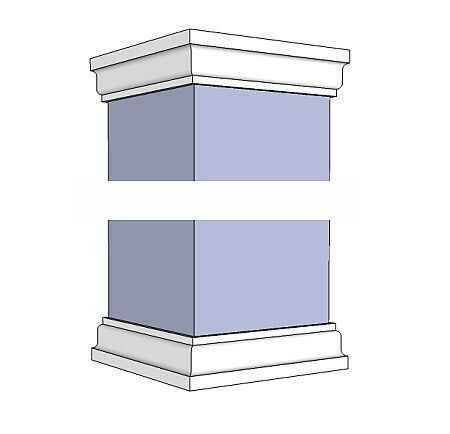 Also check to see that all four sides of the column are equal. To be safe, cut 1/8" longer and fit in place before applying glue.